iMovie version 10.0.8 comes a little over one month after the last update brought support for haptic feedback and Force Touch features compatible with Apple's new MacBook trackpads. 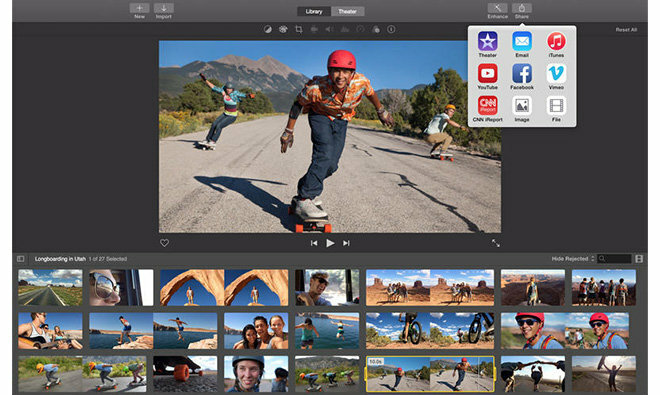 Apple fails to detail exact changes included in the latest iMovie build, noting only that compatibility with sharing video projects to YouTube has been updated. The same share sheet pop-up appears and upload speeds seem to be in line with past versions. Apple also fixed a bug that could cause iMovie to unexpectedly quit on launch. The cause of the random crashes is unclear, though a number of users on Apple's Support Communities forum reported seeing the issue shortly after version 10.0.7 was released. Earlier today, Apple patched a separate bug that caused newer iMacs to freeze and restart. That issue was traced back to viewing large JPEG files in Finder or Preview. iMovie for Mac version 10.0.8 is available now as a free update, while new users can purchase the app for $14.99 from the Mac App Store.